ProShares reverse split UVXY for the ninth time on September 18, 2018, with a 5:1 reverse split (press release). Sometimes ProShares will do a 4:1 split because of issues with adjusted options, but this time 5:1 worked well on that dimension. Proshares also reverse split its inverse -0.5X fund SVXY, which is a bit of a surprise. Perhaps they want to help people forget the 90% drawdown of February 5th, 2018. Because of the dramatic volatility swings in February 2018 Proshares decided to reduce the leverage on UVXY from 2X to 1.5X. This will reduce UVXY’s performance during volatility spikes but it will also reduce its decay rate when volatility is subdued. 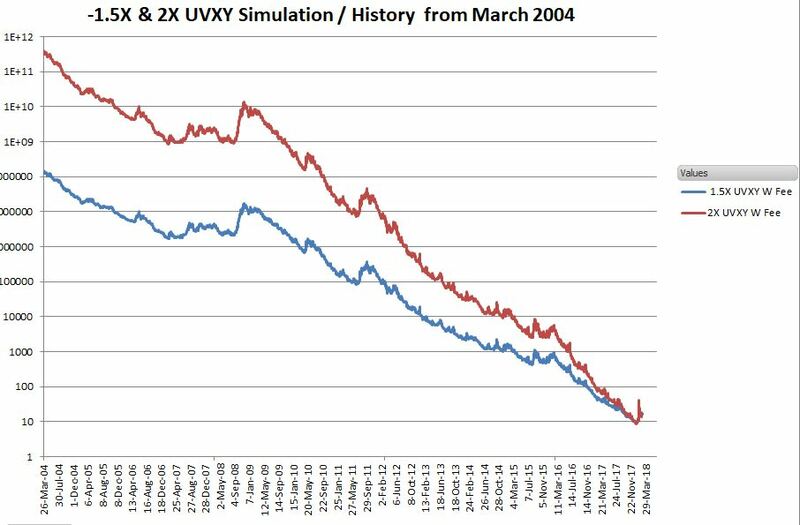 My simulations indicate that UVXY’s average annual decay rate will drop from around -82% a year to -68% a year. This doesn’t seem like a lot but in practice, it will be significantly stretch out the time between reverse splits. Proshares’ 1.5X leveraged short-term volatility ETP, UVXY, must frequently reverse split to keep their prices in a reasonable trading range—otherwise, its share price would rapidly approach zero. For example, an original share of UVXY purchased for $40 at the fund inception in 2011 would now be worth less than 0.0001 cents. High contango levels for most of 2017 have ravaged UVXY setting up the need for another reverse split in 2018. For a discussion of what causes this ruinous price erosion see “How Does UVXY Work?” Lacking bear markets these funds are ravaged by contango at rates that vary between 50% and 75% per year. Monthly decay rates run in the 7% to 18% range. See this post for a chart showing how those decay rates have changed over time. 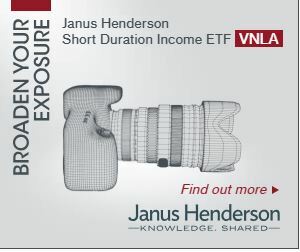 From my simulations, 1.5X leveraged volatility funds will reverse split about every 8 to 22 months. If you hold shares of UVXY there isn’t anything to worry about when it reverse splits. The value of your investment stays the same through the reverse split process. You just have 5X fewer shares that are worth 5X more each (assuming a reverse split ratio of 5:1). If your share holdings are not a multiple of five, say 213 shares, you will get 42 reverse adjusted shares and a cash payout for the 3 remaining pre-split shares. If you are short UVXY, same story, no material impact. If you were holding UVXY options (long or short) when the reverse split occurred there’s still no material impact, however, the option chains are going to hurt your head for a while. The Options Clearing Corporation adjusts for the reverse split by changing the number of shares per contract from usual 100 to 20. The option chains don’t adjust the strikes and the underlying symbol changes to UVXY3—which is 20% of UVXY’s price. New options will be generated with UVXY as the underlying, but the old adjusted options will hang around until they expire. I’ve seen reports that the liquidity on the adjusted options is not good, so if you are planning on exiting your options, rather than just letting them expire you should consider closing out your positions and re-establishing them after the split. For regular, forward splits things are more straightforward —the strike price of the options are divided by the split ratio, and the number of contracts is multiplied by the split ratio. See the OCC memo on a previous SVXY’s 1:2 split for an example. SVXY did a 1:2 split on 14-July-17. This basic approach can’t be used on reverse splits (multiply the strike price and divide the number of contacts by the split ratio) because depending on the number of contracts held some customers would end up with fractional contracts—which is a no go.